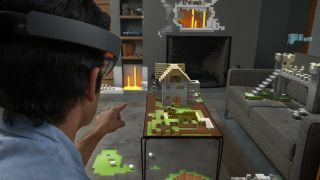 Microsoft’s HoloLens AR headset was announced over two years ago, but the creator has admitted the company is still not close to releasing a consumer ready version. Alex Kipman, the inventor of HoloLens, has said there are plans to sell the device as a non-dev kit but it’s going to take a while longer. Kipman told CNET, “You have to reduce the price point until it's affordable to the majority of the populous of Earth, which will be under a $1,000 and then some to get there. " He confirmed the company had a roadmap planned for the Microsoft HoloLens, but he couldn't announce or talk about it. Microsoft has a few areas it wants to work on before it can release the wearable headset to the mainstream market. Those are increasing immersion and making it a more comfortable experience to wear a HoloLens. We took a look at the original development kit and noted how it was difficult to fit and had a field of view that needed improvements before it was ready. Although there are plans for HoloLens to come to the consumer market Kipman did note, "we're focused on enterprise today, where we've been transforming people's lives since last year."